An addictive Oriental Gourmand fragrance, this intoxicating Eau de Parfum resonates with the sensuality and self-confidence of the BOSS Woman, making her irresistible to the BOSS Man. 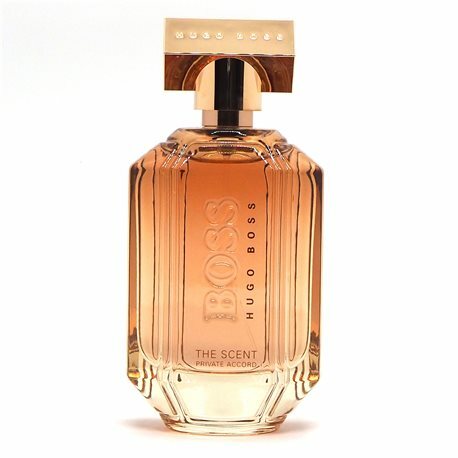 With BOSS THE SCENT PRIVATE ACCORD, the hint of Dark Roasted Cocoa in the original BOSS THE SCENT For Her deepens and intensifies into the aphrodisiac allure of Cocoa Absolute. Its dark, addictive appeal is enriched with exquisitely fresh Sweet Mandarin and captivating notes of Osmanthus Flower. The perfume’s sophisticated charm lingers long on the skin, as the fragrance dries down to a finish of Roasted Tonka Bean, a warm echo of the addictive Cocoa accord.